When I was in the Soda Gallery in the Bishop Arts District I noticed a notice posted inside extolling the virtues of Ramune Soda. 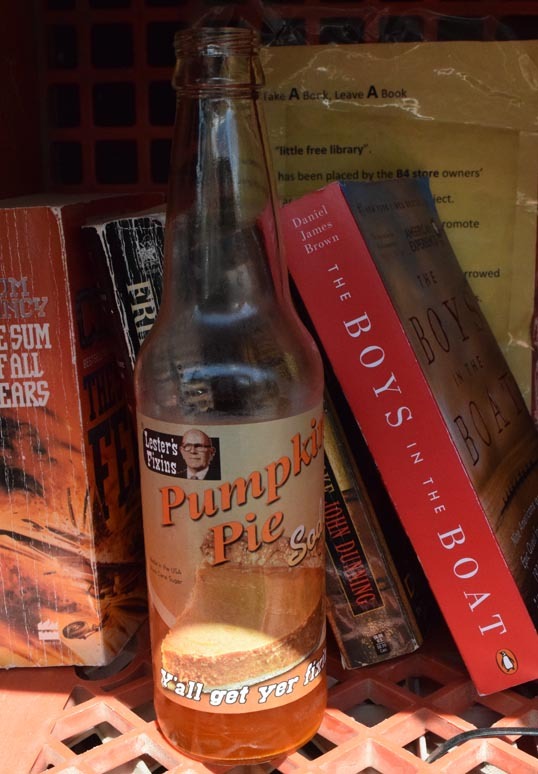 I thought about buying a bottle, but the cap looked intimidating – plus I had a hankerin’ for some Root Beer. The Ramune was stuck in my head, though. I know I had seen it before, and thought about where. One place was in the Anime, Rahxephon, that I worked my way through a couple years ago. 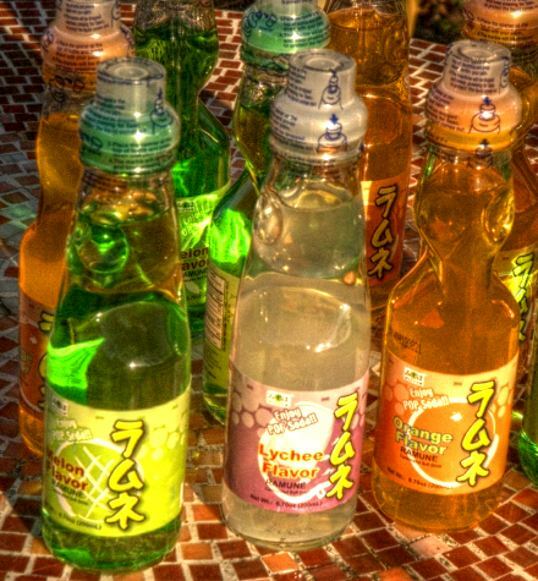 So I did some web searches on Ramune. The most famous aspect of this Japanese soft drink is the bottle. The container is sealed with a glass marble jammed up into the neck and held in place by the pressure of the carbonation in the drink. To get at the precious fluid you have to knock the marble down, presumably with the plastic plunger tool that is attached to the plastic cap. Once this trick is accomplished, you have to hold the bottle, just so, in order for the marble to be caught between two little glass ears inside the neck, or else it will fall back and jam the opening. I was thinking about it and realized that they probably had Ramune at the Saigon City grocery store down in my neighborhood. They specialize in South Asian products, but have enough Japanese items that surely a few bottles of Ramune would slip in. I walked down there and, sure enough, they had a little section of Ramune. Their selection of flavors wasn’t great, especially since I wanted to restrict myself to the glass bottles (plastic Ramune bottles? Oh, that’s just not right). I gathered up some Orange, Melon, and Lychee flavor and lugged it home. I drank a couple, and gave the rest out as Christmas Stocking-Stuffers. The Ramune Cap, with instructions. If you've never opened one before... your gonna need this. 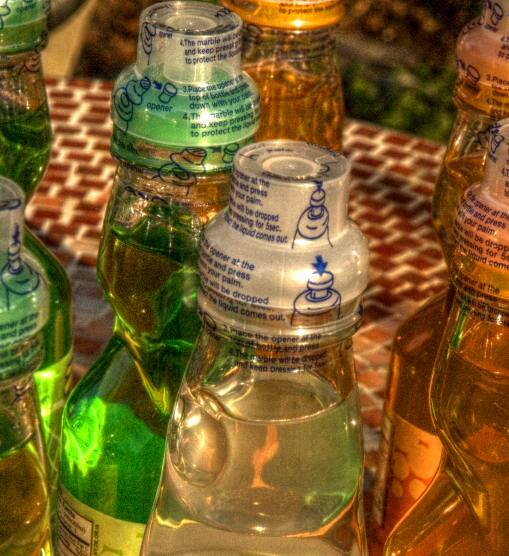 The Ramune bottle is fun – cool to look at, interesting to open, and, best of all, the marble that rattles around in the neck of the bottle is an entertainment even after all the sugar water is swallowed. The history of the bottle is as cool as a rattling marble. It began with an Englishman, Hiram Codd, in 1872. He came up with the idea of using a marble to plug the neck of a bottle of carbonated beverage. 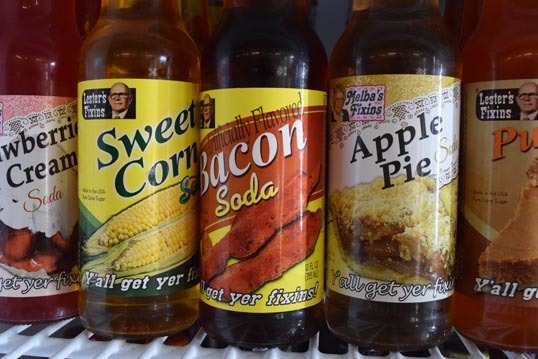 For many years, this was the standard in Europe for bottled soft drinks. Because children would break the bottles to get at the marble inside – these old Codd bottles are collected and rare types are very valuable. Apparently, the Codd bottle was never very successful in the United States, because the filthy Americans couldn’t follow instructions and would push the marble down with their filthy American fingers – thereby contaminating the beverage. Eventually, the crown cap was invented and took over the industry. Except in Japan, where there was some resistance to changing over – the new automated bottling lines were expensive and the children were attached to the bottle with the marble in the neck. The Codd neck bottle died out in Europe, but has continued to be popular in Japan. There are Codd neck bottles produced in India too, to support a cottage industry production of a drink called Banta. Now there is an American version of Ramune in Codd bottles, called Marble Pop. I’ll have to get a bottle of this. Oh, and here’s a link to another youtube video that has disabled embedding (some of you guys might prefer this one). There are some really cool places in the Bishop Arts District. One of them is The Soda Gallery. It’s the place where you can hang out… and it gives the phrase “pop art” a new double meaning. 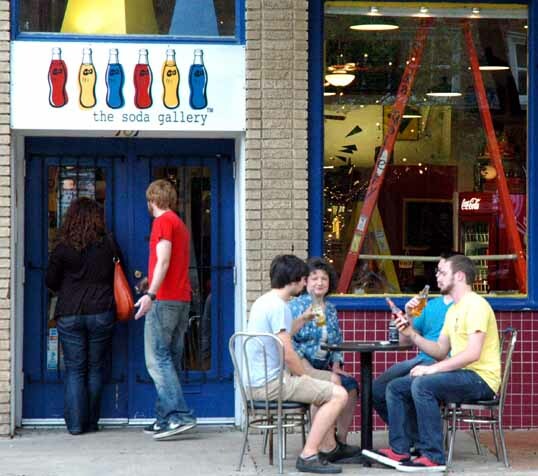 It’s a little art gallery and it’s a soda shop… it’s both. So you can go inside and make a selection from their extensive collection of soft drinks – 30 kinds of root beer, Dublin Doctor Pepper, Nesbitt’s, Ramune (the Japanese stuff with the marble), and so on and so forth. They have a nice little table out on the sidewalk and I watched some groups buying sodas and sitting there drinking them. What a nice idea! 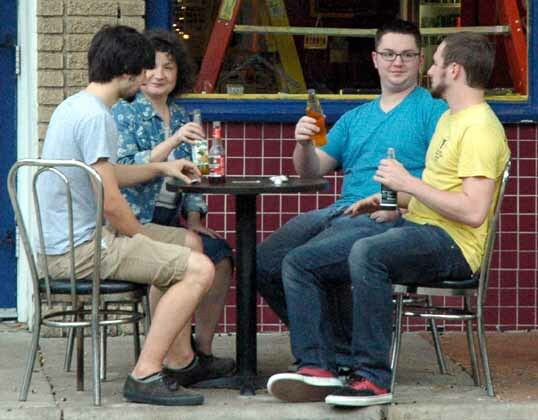 I am so down on alcohol right now – it’s cool to find another option for social interaction other than booze or coffee. And inside they do have art displayed on the walls. They had some really good stuff – screenprints of superheroes or comic book panels and other examples of local pop art. I wish this place was in my neighborhood – but I’ll go visit when I can. 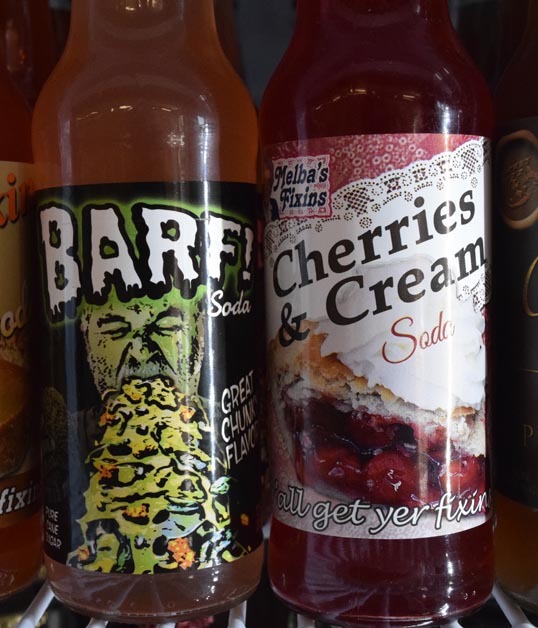 On the Soda Gallery’s website they have some examples of interesting soft drink ads… here’s some for your enjoyment. Nesbitt’s Orange, from the 70’s. There is a lot of Robert Crumb psychedelic stuff going on here.